One of the many things that brought Lelanya and I together is our love of travel. With over 30 countries between us, picking out a honeymoon location was not going to be easy but it was going to be a lot of fun. So while my bride-to-be took care of the wedding plans, my job was to find the right destination. Her top request: a place with a distinct culture and steeped in history. My top request: a place with great food and blue water for sea kayaking. It wasn't long before we settled on the Dalmatian Coast region of Croatia. The Croatian coast offered us an archipelago of over 1400 islands full of wonderful people, fantastic Italian-influenced food, and a history of Illyrian, Roman, and Greek culture reaching back over 2000 years. The more research we did, the more we kept hearing how Croatia was what Greece was 20 years ago: culture rich ancient walled cities, white houses on hillsides with red-tiled roofs, and a place largely off the map for U.S. tourism. That was exactly what we found and with our years of traveling, Croatia is one of the first countries we have ever seen whose reality exceeds all expectations; words and pictures do not do it justice. So with a long coast to explore, we decided to fly into the city of Split which is located approximately in the middle in order to make day trips to all the places we wanted to see in this diverse region. Split also is one of the few international airports that is available during the off season to fly in to. With such a beautiful coast, most of Eastern and even Western Europe is now very aware of how great Croatia can be to spend the summer in, so our plans to be there May 6th to May 18th worked perfectly for us as the prices were still low and the streets were not crowded, and yet the days were warm and sunny and perfect for walking and exploring. In fact our first impression of Croatia was the wonderful smell of everything in bloom. Flowers were everywhere, on hillsides, beside the road, and in every window sill and garden. Lelanya could hardly walk 10 feet without stopping to smell another rose, and after all isn't that what life is supposed to be all about? 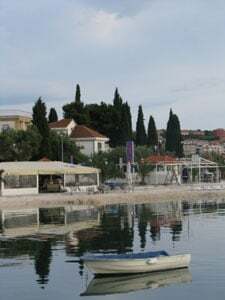 But even though we flew in to Split, we did not want to stay in a bigger city so out of a myriad of choices we decided on the island of Ciovo. 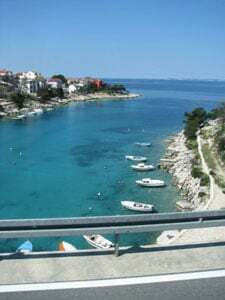 Ciovo is only 30 kilometers from Split and is connected to the mainland by a series of bridges, first onto the UNESCO world heritage site of the island of Trogir (more about this soon), and then onto Ciovo. 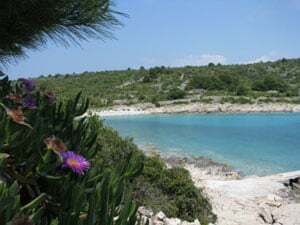 This location gave us access to the day trips we wanted on the mainland which the outer islands could not, the convenience of public transportation, and still allow us to have a view of the Adriatic Sea and be away from the hustle and bustle of the main areas. Finding this idyllic spot was not easy however. The internet is an amazing thing, but Croatia is just now realizing its full potential as a tourist destination plus many of the websites that exist are designed for the target market of German or Russian travelers that Croatia sees more often. But the Dubravka Apartments and the Mise family are building an excellent business with an incredible home and wonderful service, and thanks to their college student son, they have a very good website in English that shows what they offer. I was quickly impressed not only by the pictures of the accommodations, but also by the owners' friendly replies to my emailed questions. The owners met us at the airport to pick us up and negotiate the crazy Croatian traffic through a series of bridges and winding streets to deliver us safely to their home, where we were renting a furnished apartment just above where they lived. Mrs. Mise had even fulfilled my request to have a fresh bouquet of Daisies, my new wife's favorite flower, on display in our room as well as surprising me with a second flower arrangement in the shape of a heart with doves and rings to celebrate our new marriage. To top it off, they also had stocked our small fridge with champagne, juice, and cold beer: a nice welcome indeed. But for all these amenities, we were distracted by the view. Our balcony looked out upon a sleepy village and small bay of picturesque wooden fishing boats and shimmering water. I began taking pictures immediately and did not stop the entire honeymoon! I will run down the itinerary quickly, as there is so much to do in this wonderful country that everyone will want to plan their own days' adventures differently. Daily we walked over to the close island of Trogir. This island city is an excellent example of the romance and history of the Dalmatian Coast. It is a very small island surrounded by bright blue water where an ancient walled city was built starting before the Common Era. The large yachts and small fishing boats line the sea wall next to the promenade where you can walk and choose between a variety of wonderful cafes and restaurants serving fresh seafood or the every popular (and affordable) pizzas. Next you walk through the large city gates and stroll among the cobblestone alleys, winding in and out of a labyrinth of tall buildings that open up into the city square. The typical city layout has this socially important square besides the cathedral and city government offices, and today they are the meeting place for tourists and locals alike who want to be surrounded by the atmosphere of thousands of years of history while sipping a cappuccino and people watching. We spent many days wondering through the small shops and eating at the restaurants on this tiny postcard island. From a travel agency on Trogir called Portal, we booked our first tour to the river and waterfalls of Krka National Park. While we both typically avoid anything named "tour", our brief experience with the over zealous drivers on the narrow streets full of honking cars and scooters at full throttle were enough to convince us to let someone else do the driving. An English-speaking guide took a tour bus full of German and English tourists along the coast where we watched a series of gorgeous villages, islands, and sea views wind in and out of the rolling hills. We stopped first in Sibenik to tour another UNESCO heritage site, the cathedral of St. Jacob, and then on to the park. We boarded a large open-top ferry and rode up the small river to the looming sound of tons of water falling. 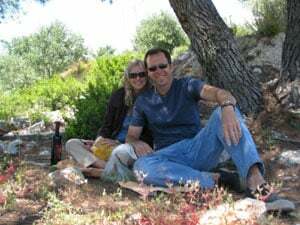 The waterfalls of Krka Park are one of the most romantic spots either of us had ever been to, although being on your honeymoon helps. The rest of our days were filled with kayaking and exploring the coast, picnics of fresh made sheep cheese and local wine, and hiring a fisherman to take us out to an outer island for a "fish picnic" where he prepared an incredible meal of fresh caught fish over an open fire while we swam the still very cold water and looked through stone-piled fences built by a people and a time that will always be a mystery. According to our host, every island along Croatia is covered with these low stone fences for protection and agriculture and has been so for all recorded history. I picked up a stone and replaced thinking I may have been the first person to do so for a thousand years. We originally planned more trips to the cruise ship destination town of Dubrovnik as well as to some of the larger island such as Pag or Korcula, but in the end we were so peaceful and content with our little slice of paradise on Ciovo that we didn't want to spend our short time traveling too much. Our last night there, our host family made us a traditional dinner of a fish stew over their outdoor fireplace. As we dipped bread into olive oil made from the trees around us, drank wine made from the vines above us, and ate fresh baklava offered constantly by our gracious new friends, we both felt this was an incredible way to start our lives together. Thanks to the helpful wedding registry site of Traveler's Joy and the generosity of gifts from friends and family of almost $2000, we were able to enjoy a memorable trip. The total cost ended up around $5000, but most of that was due to the rising cost of airfare and the fact that there are no direct flights from the United States to Croatia. But mad dashes through foreign airports are a good part of what makes the memories last, and we would definitely recommend the Croatian Coast to anyone who wants Mediterranean views with a unique and historic culture. Thank you Traveler's Joy for helping to make this possible!